Don't allow your cat's destructive behavior to get out of control. When your cat chews or scratches off-limit items, such as furniture, wires or plants, stopping her destructive behavior is essential. In addition to saving your valuables, you might also save your kitty from potential hazards. Teach your cat right from wrong without making her fear you. Spray a commercial cat repellent on the items that are off-limit to your pet companion. The unappealing taste or smell of the repellent might motivate your cat to leave the items alone. Alternatively, attached cotton balls sprayed with perfume on the objects or stick a piece of double-sided sticky tape or aluminum foil on them. 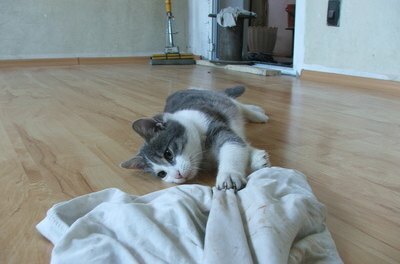 Place scratching posts near items that your cat likes to scratch. Use scratching posts that resemble the texture and shape of the off-limit items. For instance, if your kitty likes to scratch the carpet, purchase a carpet-covered scratching post that you can lay down on the floor. If your cat scratches the drapes, buy a vertical post that's tall enough so your cat can get a good stretch. Show your kitty the scratching posts and praise and reward her with a cat treat when she uses them. If needed, sprinkle some catnip on the posts or attach some cat toys to them to entice her to use them. Position an empty can filled with coins so it easily tips over when your cat is about to scratch an off-limit item. When the can falls, the noise will startle your kitty and might keep her from doing damage. Redirect your cat to a scratching post to show her what she's allowed to scratch and praise her when she uses it. Schedule regular play dates with your cat to stop her destructive chewing, which might be triggered because she's teething or looking for comfort. When you're not there, a treat-filled cat toy can provide hours of fun. Add some parsley or lettuce to your cat's food if she's eating your houseplants. Your cat might desire more vegetable matter in her food. Alternatively, gradually switch to a cat food that's higher in fiber or provide a tray of oat grass to nibble on. Block your cat's access to off-limit items that she likes to destroy, if you can't observe her during the time you're correcting her behavior. Close the door to the room in question. Consult your veterinarian if all your efforts to correct your cat's destructive behavior fail. A medical condition might be to blame. Your veterinarian can make a diagnosis and prescribe medication to help correct the behavior. Cat-proof your home -- remove plants that are poisonous to cats. Contain electrical wires in plastic tubing or hide them behind furniture. Trim your cat's nail regularly so they remain dull and can't do that much damage. Cover your kitty's nails with plastic claw caps to avoid any unwanted damage while you're trying to correct her destructive behavior. These commercial nail covers come with a special glue to attach them and can be replaced when they come off. Avoid yelling or hitting your cat when she displays destructive behavior. This only makes her fear you and she might continue the behavior when you're not there.